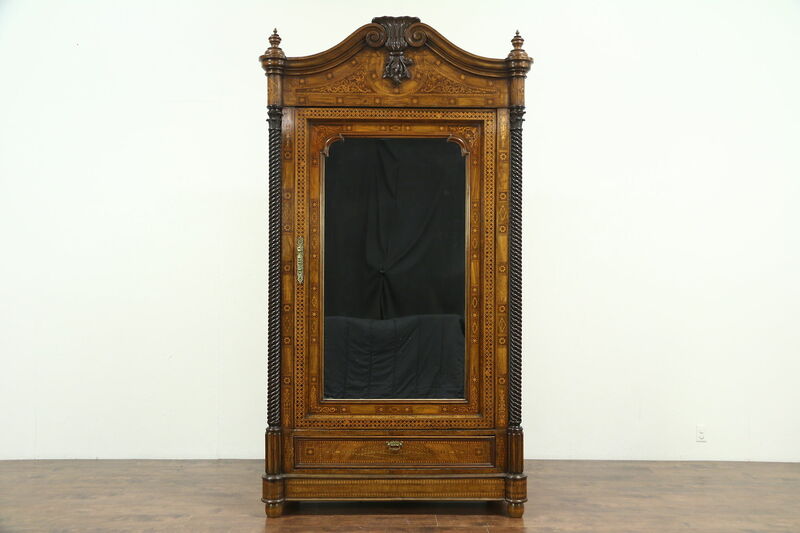 A magnificent inlaid marquetry armoire or "Schrank" was hand made in Germany around 1825. Exquisite and intricate inlaid patterns incorporate thousands of tiny pieces of satinwood, ebony and burl set in a walnut background. The crest and spiral columns are hand carved on this masterful European antique, which shows Biedermeier influence. There is a secret drawer in the base. The old finish has wonderful warm patina, waxed and buffed so all that is needed to maintain its warm glow is an occasional wipe with a soft dry cloth. There are numerous losses and shrinkage separations from age, see photos. Brass pulls are well over 100 years old but not original, the drawer has hand cut dovetailed joints. This heroic furniture can be disassembled for easier moving. The empty interior is 19" deep and has some later panels, it could be fitted with shelves or a closet pole as desired. Measurements are 57" wide, 8'8" tall and 25" deep.